That looks amazing, I bet the sour cream really makes the texture. And that topping! Your picture is beautiful Jen! Looks fantastic! i agree that pound cakes can be dry a lot of the time. sour cream in recipes always creates winners! and i love, love, love lemon+coconut combos! this looks like a great recipe!!! I combined this recipe (less eggs & sugar – yeah!) with one of barefoot contessa’s recipes – for honey vanilla pound cake. I used lemon, honey & vanilla; left out the coconut. DELICIOUS! My neighbor has made two of the other pound cakes in that same Southern Living and they were the best I have ever had. Perfect texture, very moist, sounds just like your experience. I was the lucky taster! She made the Key Lime Pound cake and the almond pound cake, I can highly recommend both. I’m making this now, and I may have tasted some of the leftover batter off of the mixing bowl of my stand mixer. If the cake is as good as the batter, I’m in love. Thanks so much for posting this. definitely making this for Easter!!!! thanks for posting!! Thanks for sharing Jenn! 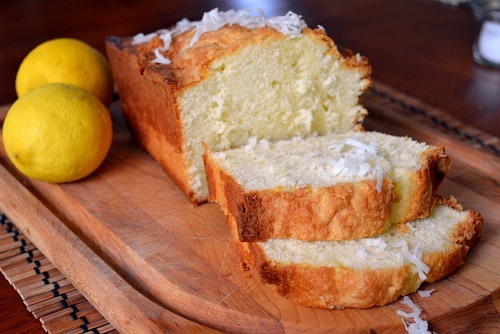 I make almond pound cake and lemon pound cake all the time…but now I want to add coconut! Also, I’m going to make Greek Chicken Burgers for dinner tonight. Thanks for the suggestions!